Without a doubt, book publishing is an industry in a state of flux, but even the nature of the flux is up for grabs. Take a recent example of the traditional tech-journalism take on the situation, an article by Evan Hughes for Wired magazine, titled “Book Publishers Scramble to Rewrite Their Future.” The facts in the story are indisputable, but the interpretation? Not so much. The news peg is the success of a self-published series of post-apocalyptic science fiction novels, “Wool,” by Hugh Howey. Available as e-books and print books from Amazon, the series became a hit, and Howey recently sold print-only rights to a New York publisher, Simon & Schuster. Print-only because Howey and his agent determined that they were making plenty of money selling the e-books on their own. Yes, it’s notable that Simon & Schuster shelled out a six-figure advance for this deal, but publishers have been known to offer similar advances for books that they only hope will find a large audience. “Wool” is that rare thing in book publishing, a known quantity, and a series on top of that, so there are multiple titles to sell.There is surely a sizable untapped market for print editions of “Wool” because e-books remain only 25 percent of the book market. When Bookish launched a couple weeks back I didn’t think much of the site. The press release claimed that Bookish would be a great community that would help readers find their next book, only there was no community and the discovery engine was less than amazing. I suspected at the time that Bookish would turn out to be little more than a marketing tool for the 3 publishers who financed the site, and today I learned that my suspicions were correct. Peter Winkler, writing for The Huffington Post, noticed that all of the books promoted on Bookish were published by either Hachette, Penguin, or Simon & Schuster. Three US independent bookshops have launched a lawsuit against the big six publishers and Amazon in America claiming that by signing a contract to sell e-books with DRM through Amazon, they are combining to restrict the sale of e-books through indie stores. Fiction Addiction in South Carolina, Posman Books in New York [pictured] and Book House of Stuyvesant Plaza are taking the action against Hachette, HarperCollins, Simon & Schuster, Penguin, Random House, Macmillan and Amazon claiming that the publishers signed contracts with Amazon to sell e-books with DRM that was “specifically designed to limit the use of digital content” to Kindle devices, according to Publishers Lunch. LURID: vivid in shocking detail; sensational, horrible in savagery or violence, or, a guide to the merits of the kind of Bad Books you never want your co-workers to know you’re reading. Happy birthday, Patrick Bateman! On March 6, 1991, American Psycho was published amidst howls of protest, calls for censorship, and vicious reviews dismissing it as superficial trash. Twenty-two years later it’s considered a classic. 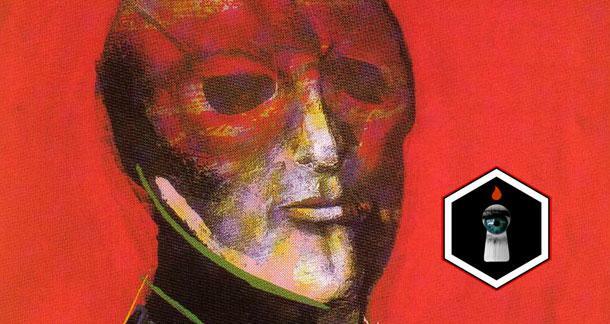 It’s sold more than a million copies in the US, been reprinted more than fifty times, and its anti-hero is guaranteed to make an appearance as a costume at a Halloween party near you. How did such a reviled book become such a vital cultural reference point? The brouhaha surrounding American Psycho began months before the book hit stores. In August 1990, when female employees at Simon & Schuster learned about the subject matter of Bret Easton Ellis’s third novel, they objected in the strongest terms to scenes detailing the torture and murder of women. After Time and Spy magazines ran stories about the protests (Time called the book a “childish horror fantasy”) including leaked excerpts, Simon & Schuster (despite the $300,000 advance paid to Ellis) abruptly canceled publication. 48 hours later, Ellis’s agent resold the manuscript to Sonny Mehta at Vintage, sparking even more outrage. Tammy Bruce (from the Los Angeles chapter of the National Organization for Women) described it as “a how-to novel on the torture and dismemberment of women” and called for a boycott of all Vintage books if publication went ahead. Book retail website Bookish has launched, featuring content including book recommendations, extracts, articles by a dedicated editorial staff, and partnerships with the Onion and USA Today which are aimed at driving readers to the site. The initiative is backed by Hachette, Penguin and Simon & Schuster in the US. Users can sign up to receive newsletters, book and author news and create personal bookshelves, and share content over social media and email. The recommendation engine on the site is fed by Bookish editors, authors, book editors and publishers. 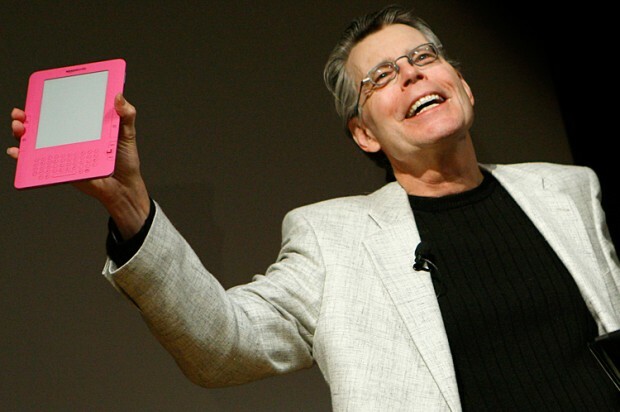 Is Exploiting Authors To Be The New Publishing Model? Radical concept: could publishers start treating writers as partners? Is there anybody in trade publishing who is willing to partner with writers as equals? That’s the question that urgently needs to be answered as Simon & Schuster (S&S) adopts the dubious new business model that’s emerging around the surge in self-publishing. Instead of selling underpriced books to readers, it seems publishers will now sell overpriced (and in some cases, substandard) services to writers. Shame on you, S&S, for sullying your name by linking with Author Solutions, one of the most exorbitant and substandard of them all. And on you too Penguin-Pearson, for kicking off this sorry trend with your purchase of Author Solutions earlier this year. There Can Be Only One! 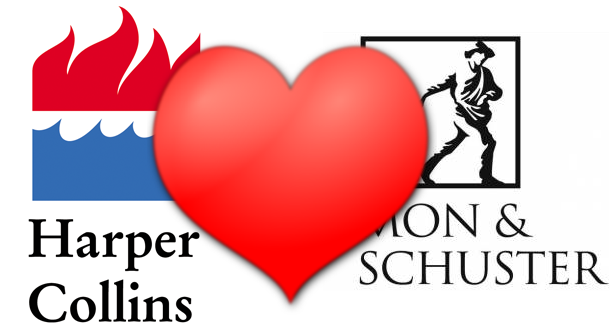 : Harper Collins and Simon & Schuster To Merge? Talk about the silly season. In yesterday’s news, it was announced News Corp. International — who already owns Harper Collins — has expressed interest in buying publishing house Simon & Schuster, only a few weeks after they attempted to buy Penguin prior to its merger with Random House. Simon & Schuster, HarperCollins, Hachette Livre and Macmillan owner Verlugsgruppe Georg von Holtzbrinck have offered to allow retailers including Amazon to sell their e-books at a discount for two years in a bid to end an EU antitrust investigation and stave off fines, according to a Reuters report. Apple, with which the publishers have entered into agency pricing agreements, is also said to have agreed on the concessions. Penguin, a fifth publisher which employs agency pricing on e-books, is not identified as having offered the concession. 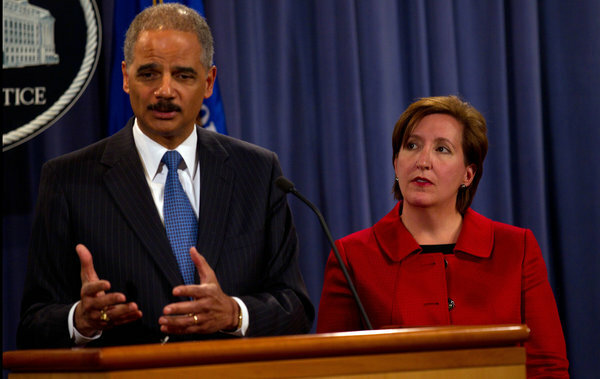 Eric Holder with Sharis Pozen, acting assistant attorney general, discussing the price-fixing case. The Justice Department finally took aim at the monopolistic monolith that threatened to dominate the book industry. So imagine the shock when the bullet aimed at threats to competition went whizzing by Amazon — which not long ago had a 90 percent stranglehold on e-books — and instead, struck five of the six biggest publishers and Apple, a minor player in the realm of books. That’s the modern equivalent of taking on Standard Oil but breaking up Ed’s Gas ’N’ Groceries on Route 19 instead. The suit has its roots in 2007, when Amazon released the Kindle and began selling some of the most sought-after books for $9.99 in order to bolster sales of its device. Not surprisingly, booksellers and publishers hated this price with the force of 10,000 suns because it made physical books sold for $25 or more seem outrageously overpriced. Under the wholesale arrangement with Amazon, the publishers received half of the list price, which yielded better money, but gave them no control over the pricing of their product. With the introduction of the iPad, publishers got a crack at remaking their deal because Apple allowed them to set the price and then took a cut of 30 percent. Return to Ribblestrop by Andy Mulligan (Simon & Schuster Children’s Books) has been awarded the Guardian Children’s Book Award, beating off shortlisted titles including David Almond’s My Name is Mina and Simon Mason’s Moon Pie yesterday. The book is about a boarding school called Ribblestrop where the children call the shots. The first title in the series, Ribblestrop, was also shortlisted for the Roald Dahl Funny Prize but despite its literary successes, sales have been modest.